Inside the first IBM Q computation center, dilution refrigerators with microwave electronics (middle) that operate IBM Q Network clients' cloud access to 20 qubit processor. IBM announced the first clients to tap into its IBM Q™ early-access commercial quantum computing systems to explore practical applications important to business and science. They include: JPMorgan Chase, Daimler AG, Samsung, JSR Corporation, Barclays, Hitachi Metals, Honda, Nagase, Keio University, Oak Ridge National Lab, Oxford University and University of Melbourne. These 12 initial organizations join the newly formed IBM Q Network, a collaboration of leading Fortune 500 companies, academic institutions and national research labs working directly with IBM to advance quantum computing. The IBM Q Network will also foster a growing quantum computing ecosystem based on IBM's open source quantum software and developer tools. 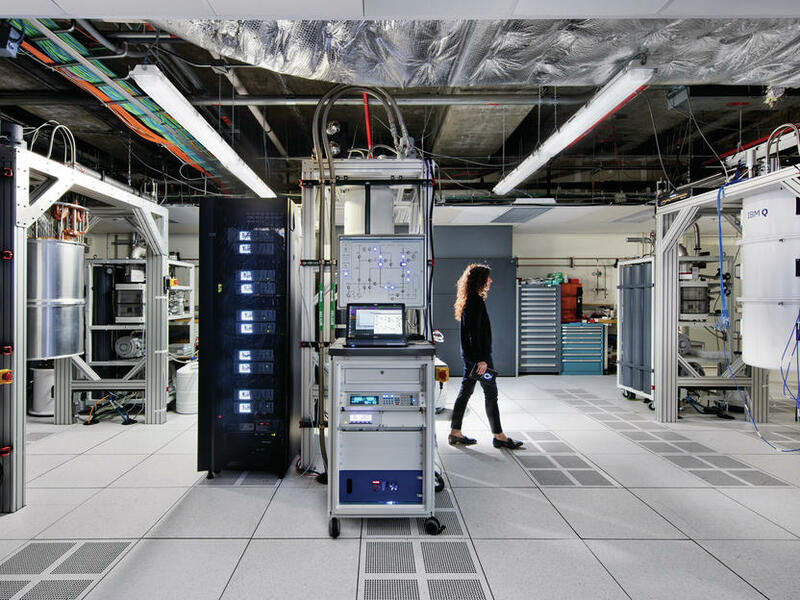 The IBM Q Network provides organizations with quantum expertise and resources, and cloud-based access to the most advanced and scalable universal quantum computing systems available, starting with a 20 qubit IBM Q system. IBM also recently built and measured the first working 50 qubit prototype processor. IBM anticipates that access to this prototype will be offered to IBM Q Network participants in the next generation IBM Q system. "IBM sees the next few years as the dawn of the commercial quantum era – a formative period when quantum computing technology and its early use cases develop rapidly. The IBM Q Network will serve as a vehicle to make quantum computing more accessible to businesses and organizations through access to the most advanced IBM Q systems and quantum ecosystem," said Dario Gil, vice president of AI and IBM Q, IBM Research. "Working closely with our clients, together we can begin to explore the ways big and small quantum computing can address previously unsolvable problems applicable to industries such as financial services, automotive or chemistry. There will be a shared focus on discovering areas of quantum advantage that may lead to commercial, intellectual and societal benefit in the future." Organizations will work directly with IBM scientists, engineers and consultants to pioneer quantum computing for specific industries and have direct cloud-based access to IBM Q systems. Each of the IBM Q Network Partners below will explore a broad set of potential applications of quantum computing in their industry that could provide a quantum advantage – demonstrations of real-world problems that may be solved faster or more efficiently with a quantum computer than with a classical computer. JPMorgan Chase will be the premier global financial services partner with IBM, focusing on use cases for quantum computing applicable to the financial industry including trading strategies, portfolio optimization, asset pricing and risk analysis. Daimler AG will work with IBM to advance the potential use cases of quantum computing for the automotive and transportation industry. Some areas of research include finding and developing new materials for automotive application through quantum chemistry, complex optimization problems such as for manufacturing processes or vehicle routing for fleet logistics or autonomous/self-driving cars, and the intersection of quantum and machine learning to enhance the capabilities of artificial intelligence. Samsung, working closely with IBM, will explore a variety of use cases where quantum computing may impact the future of the semiconductor and electronics industry. JSR Corporation, a leading chemical and materials company, will explore how quantum computing can improve materials for electronics, environmental and energy applications. "As a leader in financial services technology, JPMorgan Chase is excited to collaborate with IBM Research in exploring how quantum computing may impact the industry," said Lori Beer, CIO, JPMorgan Chase. "Joining the IBM Q Network allows us to bring our technologists alongside IBM's researchers and leverage cutting-edge quantum systems to learn about how we may be able to apply these technologies in the future." "The intelligently connected car of the future requires computing capabilities not available today," says Ola Källenius, member of the Board of Management of Daimler AG responsible for Group Research & Mercedes-Benz Cars Development. "We believe that quantum computing could be a crucial element in creating sustainable and highly efficient mobility." "Samsung is excited to work with IBM to explore how quantum computing may impact semiconductor, display and IT industries," said Seongjun Park, Ph.D, Vice President at Samsung Advanced Institute of Technology. "By joining the IBM Q Network and having access to quantum systems and world-class expertise, we hope to take part in unveiling the unexplored potential of quantum computing and pave a road forward for future commercial applications." "JSR is excited to join the IBM Q Network to explore how quantum computing may impact the materials industry and address chemical challenges that are beyond the reach of today's classical computing," said Nobu Koshiba, President of JSR Corporation. "Working with IBM, JSR scientists will focus on computational chemistry and pave a road forward for potential commercial applications." Also, IBM Q Network Members Barclays, Hitachi Metals, Honda and Nagase will build their knowledge of general approaches to quantum computing and begin to investigate potential use cases for their industries of finance, materials, automotive and chemistry respectively. IBM will establish regional hubs across four continents to increase access to quantum systems and advance research, which are critical for accelerated learning, skills development and implementation of quantum computing. These IBM Q Network Hubs will broadly enable their industry and research collaborators to have online use of IBM Q systems and engage in joint development work to explore quantum computing. The planned locations for the hubs are at IBM Research, Keio University in Japan, Oak Ridge National Lab in the United States, Oxford University in the United Kingdom and the University of Melbourne in Australia. "Keio University is excited and truly honored to be selected as the only IBM Q hub in Japan," said Prof. Kohei Itoh, the Dean of Faculty of Science and Technology, Keio University. "We are looking forward to performing state-of-the-art quantum computing research using IBM Q and guiding member companies of the hub to develop mission-oriented quantum software that will help their businesses." "Providing access to real quantum computing hardware is fundamental to accelerating the development of applications and programs important to UT-Battelle, LLC., the managing and operating contractor at the Department of Energy's Oak Ridge National Laboratory (ORNL)," said Jeff Nichols, Associate Laboratory Director, Oak Ridge National Laboratory. "Establishing ORNL as a hub of the IBM Q Network would again demonstrate that UT-Battelle is at the forefront of innovation, enabled by the world's most advanced computational systems, and will continue to drive transformational advancements in science and research." "I am delighted with this new collaboration with IBM. Working with one of the world's leading information technology companies to develop new applications for a quantum computer will enhance Oxford's and the UK's capability in quantum technology, by providing a unique resource for the Oxford-led Networked Quantum Information Technologies Hub," said Prof. Ian Walmsley, Hooke Professor of Experimental Physics, Director of the Networked Quantum Information Technologies (NQIT) Hub and Pro-Vice-Chancellor for Research and Innovation, Oxford University. "NQIT's emulator program will work with IBM to convene scientists, engineers and industrial researchers and developers across a wider range of fields, from simulating new molecules to enhancing artificial intelligence to show how quantum computers can dramatically transform their ideas and businesses." "We are excited to work with IBM to explore how quantum computing could benefit Australian industry and education and address new computational challenges," said Professor Jim McCluskey, Deputy Vice-Chancellor (Research) at the University of Melbourne. "By becoming an IBM Q Network hub and having access to advanced quantum systems, it will allow our scientists to develop knowledge for quantum solutions applicable to industry problems in Mining, Energy and Finance." Through the publically available IBM Q Experience, over 60,000 users have run more than 1.7M quantum experiments and generated over 35 third-party research publications using the world's first series of quantum computers available openly on the web. The IBM Q Experience enables registered users to connect to IBM's quantum processors via the IBM Cloud, to run algorithms and experiments, work with the individual quantum bits, and explore tutorials and simulations around what might be possible with quantum computing. Developers also have access to IBM's open quantum software development kit, QISKit, to create and run quantum computing programs. Enabling high quality academic research is one of the core principles of the IBM Q Experience, and now registered academic users can leverage the IBM Q Experience for a deeper research collaboration. Professors and researchers will find customized tools designed to accelerate and differentiate their work including preferred queue access to IBM's quantum processors, the ability to link and tag their research to the IBM Q Experience, and channels to request new features and functionalities. Users have registered from over 1500 universities, 300 high schools, and 300 private institutions worldwide, many of whom are accessing the IBM Q Experience as part of their formal education. The IBM Q Experience will also play a significant role in an initiative IBM is undertaking with the Massachusetts Institute of Technology. IBM will support MIT in producing a leading edge, comprehensive curriculum for executives, engineers, scientists and researchers to understand and leverage the upcoming quantum computing revolution. The first courses are anticipated to go online in the first half of 2018 via the edX platform. The curriculum will include a set of MIT created massive open online courses (MOOCs) that will be offered both for free and for a fee to learners who desire an MIT issued certificate of completion. The curriculum will also include a comprehensive professional development curriculum (MIT ProX courses). These latter courses will include online labs on quantum computing, which will utilize the public IBM Q Experiencequantum computers. In addition to supporting the quantum curriculum, IBM has started working with MIT to explore the intersection of quantum computing and machine learning as part of the recently launched MIT-IBM Watson AI Lab. Together, IBM and MIT scientists are investigating the "Physics of AI", which involves new research into AI hardware materials, devices and architectures. Focus areas include using AI to help characterize and improve quantum devices, and researching the use of quantum computing to optimize and speed up machine-learning algorithms and other AI applications. IBM Research is announcing a series of prizes for professors, lecturers and students who use the IBM Q Experience and QISKit in the classroom or for their research. Awards will be made available for developing open source course materials for a lecture series; building Jupyter Notebook tutorials with QISKit; contributing specific code modules to the open source QISKit SDK and to students who publish a scientific paper that makes use of QISKit. IBM is also introducing IBM Q Consulting, which brings together consultants, scientists and industry experts to help clients envision new business value through the application of quantum computing technology, and provide clients with customized roadmaps to help them become quantum ready. With access to cutting-edge mathematics and engineering, IBM's quantum consultants and developers are applying their expertise to complex business problems. IBM Q Consulting is focusing initially in logistics and modeling use cases in industries such as mining, banking, life sciences and electronics. Clients can engage IBM Q Consulting immediately.